By DOC’s Andrea Crawford, Dunedin. Over 1,000 people met three remarkable kākāpō chicks during a public viewing in Arrowtown near Queenstown recently. The smiles on people’s faces told it all—pure delight at seeing three kākāpō chicks at Arrowtown’s Athenaeum Hall. Event sponsor Real Journeys’ Chief Executive, Richard Lauder, observed that the chicks were received like “rock stars” by the local community. 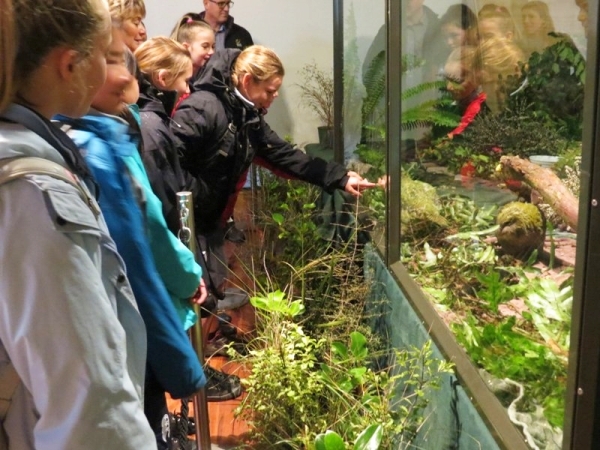 Many people at the ‘Kākāpō Chicks Day Out‘ expressed thanks to DOC, saying they appreciated how special it was to get the chance to see these remarkable, rare and charismatic native birds. It was great people got to see the chicks and learn about what makes them so special and, of course, raise awareness to assist with their recovery. Welfare of the chicks was critical, so all steps were taken to ensure they remained healthy and relaxed. They took all the attention in their stride. 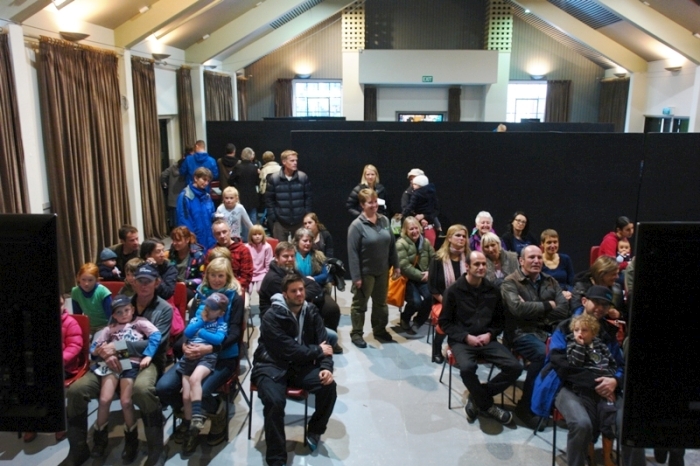 As well as a viewing opportunity, people listened to talks by DOC’s Kākāpō Recovery team, watched an audio-visual display and asked the kākāpō staff plenty of questions. 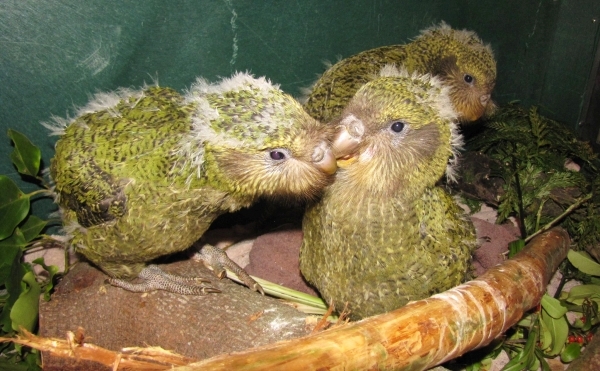 The event raised about $5,000 for the programme, through gold coin donations, merchandise sales, and through the Kākāpō Adoption Programme. The chicks will soon be moved to Whenua Hou/Codfish Island where they will spend four weeks in an outdoor pen. They will then be released into the wild and monitored closely for the next year while they are particularly vulnerable to misadventure as they learn about their wild habitat. 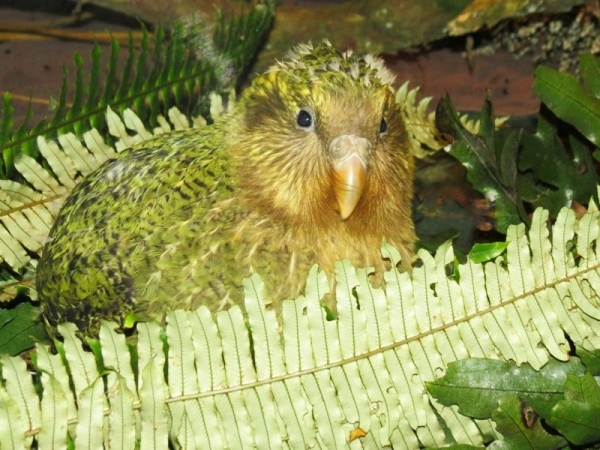 Do you follow Sirocco the kākāpō on Facebook and Twitter? This charismatic kākāpō is an ambassador for his species and New Zealand’s official Spokesbird for Conservation. Significant birthdays are always a good excuse to get dressed up and have a bit of a celebration! Zee Luv as Ah Lum extolling the virtues of Chinese tea! 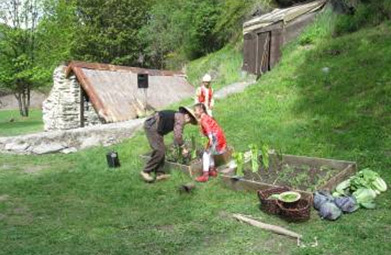 So as part of the Arrowtown Community’s ‘Gold 150’ celebrations during Labour weekend this year, the Arrowtown Chinese Settlement was spruced up, repaired, swept out and generally treated to a bit of a face lift so she was looking her best for her part in the event. Arrowtown, and a good number of visitors as well! DOC Wakatipu’s involvement in the celebrations mainly revolved around the Chinese Settlement. 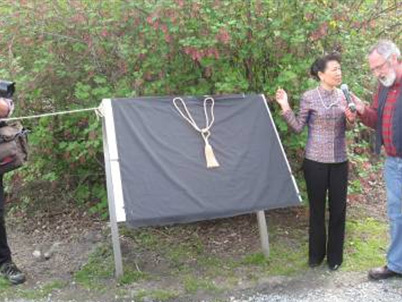 We have been working away for several months on Chinese translations of the existing interpretation panels on site, so that they were ready for the big unveiling by the Chinese Consul-General from Christchurch, Madam Tan. This gave us a great opportunity to forge new relationships with Otago’s Chinese community and open up the site to a whole new audience. 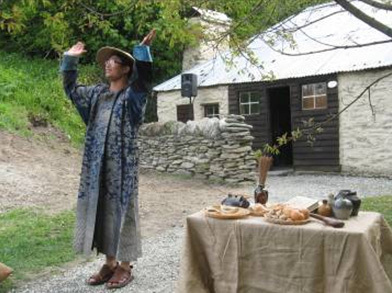 Madam Tan of the Chinese Consulate ready to unveil the new interpretation at Arrowtown Chinese Settlement. 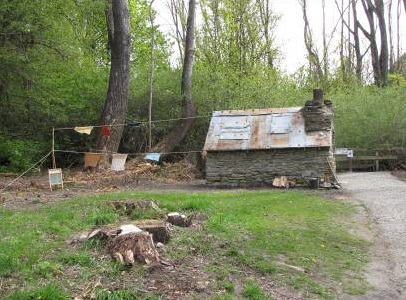 The DOC ‘Historic Boys’ (Jim, Stephen and Richard) had a full few days in the Settlement prior to the celebrations; cleaning, sweeping, repairing, re-seeding and generally making the old girl look habitable again – including the complete re-build of the chimney on Old Tom’s hut which chose to fall over in high winds 2 weeks before the celebrations – fab job boys, it looks as good as new! On the big day, DOC were involved in everything from marshalling crowds, to making sure the NZ Army band were in the right place at the right time. The lawn in front of Ah Lum’s store provided the perfect site for 16,000 Chinese crackers to go off, before Madam Tan officially unveiled the new interpretation panels and the crowds were let loose to see the Chinese Village Theatre. 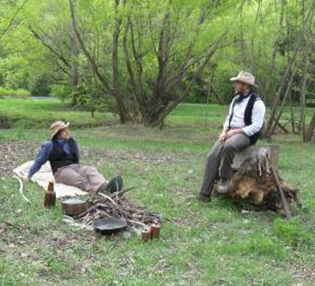 What with all that, the re-enactment of finding gold on the banks of the Arrow, the Army band, the craft market, the food stalls, the classic car parade, a beard-growing competition and about 150 other things going on in Arrowtown, it was a great weekend and a community event well worth being part of!